Serpukhov-15 (Russian: Серпухов-15) is a military townlet near Kurilovo in Kaluga Oblast which is the location of the western control centre for Russia's Oko satellites. These give early warning of ballistic missile launches, mainly from the continental United States. The site is part of the Main Centre for Missile Attack Warning and information from here is processed at the Russian Aerospace Defence Forces centre in Solnechnogorsk and could be used, together with early warning radar such as the Voronezh, for launch on warning  or the A-135 anti-ballistic missile system. A similar facility is located at Pivan-1 in the Russian Far East. The name Serpukhov-15 is a code name following the practice established to name closed cities and military facilities. 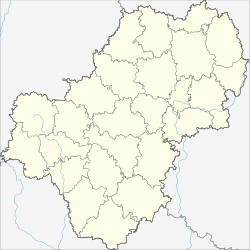 It is named after the nearest city, Serpukhov in Moscow Oblast which is about 35 kilometres (22 mi) away. Oko consists of two types of early warning satellites - US-K and US-KMO. The older US-K satellites are in highly elliptical molniya orbits which give them coverage of the United States at certain times during the day. For full coverage of the US missile grounds four US-K satellites need to be operational and the system can have up to nine of them in orbit at once. :44 The US-KMO satellites are geosynchronous satellites providing continuous coverage. In total, 101 satellites have been launched. In 1960 the site was used as one of the locations of the missiles for the S-25 Berkut (Russian: С-25 Беркут) air defence system. Later it was one of the intended bases for A350 missiles for the A-35 anti-ballistic missile system, although it was not completed. 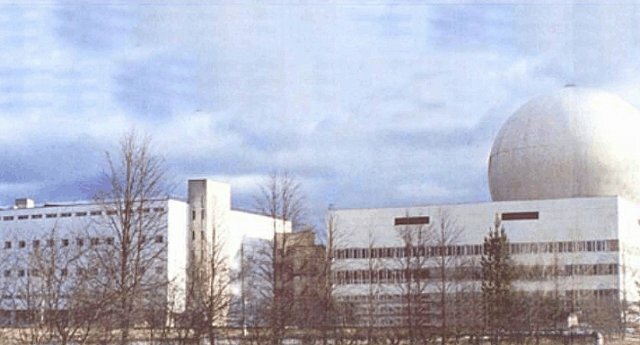 The Oko control centre was built later and was put on combat duty in 1982.:48 It consists of antennas and facilities for data processing. :40 Photographs of the site show a number of buildings and seven domes, presumably containing the antennas. As the western control centre it can communicate with geosynchronous satellites in four of the seven reserved locations, those looking over the Atlantic. The other three, looking over the Pacific, need to be controlled from the eastern centre. On 26 September 1983 the system suffered a major malfunction when it erroneously identified a launch of five Minuteman ICBMs in the United States. It appears that the system misidentified a particular set of circumstances including high clouds and the autumn equinox. :6 Lt. Colonel Stanislav Petrov, the officer on duty at the time, discounted the reports as the system had only recently become operational and the launches were not corroborated by early warning radar. At the time of the fire there were four satellites in the constellation, all US-K in molniya orbits. The effect of the fire was that control of the satellites was lost for 12 hours. Satellites in molniya orbits need contact from the ground station every 2 or three orbits to maintain their orbital position. The fire caused the loss of four satellites - two satellites were lost immediately (Kosmos 2340 and Kosmos 2351) and two more (Kosmos 2368 and Kosmos 2342) within a year due to the negative effect on their orbits. ^ Holm, Michael (2011). "916th independent Radio-Technical Unit". Soviet Armed Forces 1945-1991. Retrieved 2012-05-22. ^ a b Podvig, Pavel (2012-01-30). "Early Warning". Russian Strategic Nuclear Forces. Russian Strategic Nuclear Forces. Retrieved 24 March 2012. ^ Podvig, Pavel (1994). "The Operational Status of the Russian Space-Based Early Warning System" (PDF). Science and Global Security. 4 (3): 363–384. doi:10.1080/08929889408426407. ISSN 0892-9882. ^ Ivashko, Sergei (11 May 2001). "Серпухов-15 восстановят не скоро" [Serpukhov-15 will not soon be restored]. Gazeta.ru. Retrieved 25 May 2012. ^ a b c d e f g h i Podvig, Pavel (2002). "History and the Current Status of the Russian Early-Warning System" (PDF). Science and Global Security. 10: 21–60. CiteSeerX 10.1.1.692.6127. doi:10.1080/08929880212328. ISSN 0892-9882. Archived from the original (PDF) on 2012-03-15. ^ Krebs, Gunter. "US-KMO (71Kh6)". Gunter's Space Page. Retrieved 2 May 2012. ^ Krebs, Gunter. "US-KS (74Kh6)". Gunter's Space Page. Retrieved 2 May 2012. ^ Krebs, Gunter. "US-K (73D6)". Gunter's Space Page. Retrieved 2 May 2012. ^ Pavel, Podvig (2012-03-30). "Cosmos-2479 - new geostationary early warning satellite". Russian Strategic Nuclear Forces. Russian Strategic Nuclear Forces. Retrieved 2012-04-22. ^ Pavel, Podvig (2010-09-30). "Cosmos-2469 might be the last HEO early-warning satellite". Russian Strategic Nuclear Forces. Russian Strategic Nuclear Forces. Retrieved 2012-04-22. ^ Podvig, Pavel; Zuang, Hui (2008). Russian and Chinese Responses to US Military Plans in Space (PDF). Cambridge, MA: American Academy of Arts and Sciences. ISBN 978-0-87724-068-6. ^ O'Connor, Sean (2012). "Russian/Soviet Anti-Ballistic Missile Systems". Air Power Australia: 1. Retrieved 2012-05-23. ^ a b c d Topol, Sergey; Safranov, Ivan (11 May 2001). "У России проблемы с ПРО: Она сгорела" [Russia has an ABM problem: it burnt down]. Kommersant. Retrieved 2012-04-23. ^ Slavarko (13 March 2010). "УС-КС" [US-KS]. Panoramio. Retrieved 25 May 2012. ^ a b Forden, Geoffrey; Podvig, Pavel; Postol, Theodore A (2000). "False alarm, nuclear danger". IEEE Spectrum. 10 (3): 31. doi:10.1109/6.825657. ISSN 0018-9235. ^ Forden, Geoffrey (May 3, 2001). "Reducing a Common Danger: Improving Russia's Early-Warning System" (PDF). Cato Policy Analysis No. 399. Cato Institute. ^ Bleek, Phillipp C. (June 2001). "Fire Shuts Down Russian Early-Warning System". Arms Control Today. Arms Control Association. Retrieved 25 May 2012. ^ "Russia blaze hits satellite network". BBC News. 2001-05-10. Retrieved 2012-04-23. ^ a b Paleologue, A (2005). "Early Warning Satellites in Russia: What past, what state today, what future?". In Pejmun Motaghedi. Proceedings of SPIE Vol. 5799. Modeling, Simulation, and Verification of Space-based Systems II. SPIE. pp. 146–157. doi:10.1117/12.603478. This page was last edited on 21 February 2019, at 00:50 (UTC).